, a medium-sized globe, has been a wildly popular hybrid tomato variety on the market for more than 35 years. But it took a fight to get her into American gardens. It was horticulturist Joe Howland who led the charge to find and develop a short-season tomato that had flavor – and was able to withstand large temperature shifts. In the 1970s, Howland served as chairman of Pan American Seed Company and on the board of directors for PetoSeed Company, the world’s largest supplier of tomato seed for agriculture. His passionate request for PetoSeed to breed a short-season tomato was squelched. PetoSeed, argued others in the company, didn’t do business with home gardeners. So a short-season tomato wouldn’t be cost-effective. Still, Howland believed that a tasty, reliable short-season tomato would become gardener’s gold to the company fortunate to develop and distribute it. He was proved correct. In 1974, Howland learned about a short-season tomato developed in France that not only was packed with flavor, but was attractive and able to tolerate temperatures as low as 40 degrees. A deal was made between W. Atlee Burpee Company and PetoSeed for exclusive rights to sell seed for the new tomato. Burpee featured the tomato (which Howland nicknamed “Early Girl” to complement Burpee’s successful “Better Boy” variety) on the cover of its 1975 spring catalog. Sales soared. American breeders made modifications to the original tomato, which continues to be one of the most popular varieties for the home garden. In a Sunset Magazine reader poll, Early Girl was voted favorite tomato in both 1993 and 1997.
is valued because it is an early-ripening slicing tomato packed with flavor (not usually a strength with early-season varieties) – but also for its dependability. 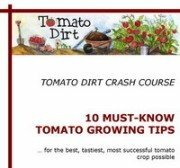 These days, Early Girl Tomato is developing a cult following among those who favor dry-farmed tomatoes – a technique in which the gardener holds back watering the plant after transplanting to force roots deeper and produce a more concentrated flavor in the fruit. Dry-farmed Early Girls are gaining enormous popularity in California, particularly in the San Francisco Bay area. Their flavor has been placed on par or even surpassing the most-respected heirloom tomatoes. Early Girl’s disease resistance and adaptability mean it performs well in almost every kind of climate. Its little sister, Bush Early Girl, has even greater disease resistance and produces fruit that ripen 4-5 days earlier – all on a compact, dwarf plant that flourishes in containers. As an extra bonus, Early Girl tomatoes are considered to be especially high in vitamins A and C.
Other strains: Bush Early Girl: same desirable qualities in its bigger sister, but in a compact habit that works great on the patio or in containers. Plus Bush Early Girl’s disease resistance is even stronger: VFFNT. Determinate.